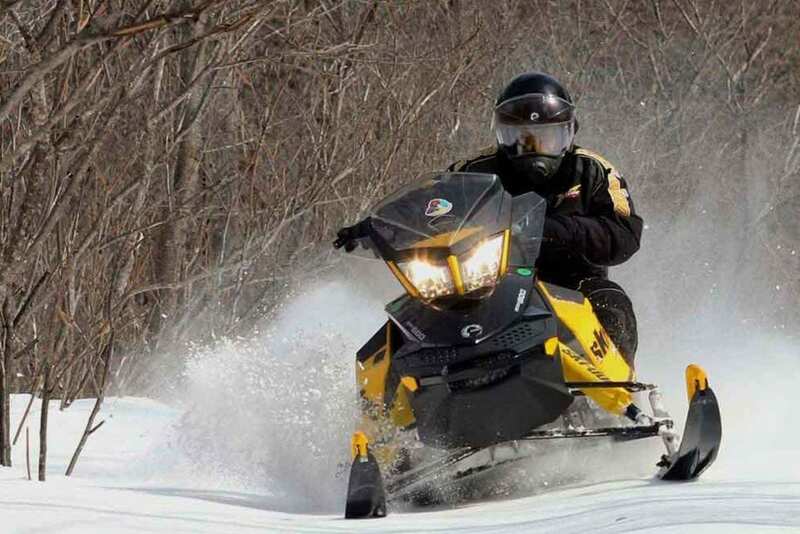 Read the owner’s manual written for your model snowmobile. If adjustments were not made in the Spring, they must be completed before using your snowmobile for the first time. Ignition * Replace spark plugs. Be sure they are gapped to manufacturer’s specifications and are the proper heat range. Carburetor/Fuel * Check fuel filter, replace if necessary. Check fuel lines for cracks or leaks. * Check fittings for leaks. Drive Belt * Check for wear and cracks. * Measure width of belt and compare to specifications. * Be sure you have a spare belt in your snowmobile. Track * Examine for broken cleats, loose or torn drive holes, and ply separation. * Alignment of track. * Track tension. Skis * Alignment * Examine for loose weld joints, loose or worn out wear rods. * Check ski bottom for excessive wear. Lights * Replace burned out bulbs. * Apply brakes to check stop lights with engine running. Clutch * Check owners manual for recommendations. Brakes * Proper adjustment. * Free operation. * Worn pads. Check for loose nuts and bolts on the snowmobile. Suspension * Idler wheels * Lubrication * Axle wheels and bearings. * Loose nuts and bolts. * Broken welds and springs. * Slide rails. Check spare parts and tools. * Light bulbs – pack so they won’t break. * Spark plugs need to be gapped. Check owner’s manual for proper setting. In an emergency, a match cover will approximate gap. * Spare belt. * Tools (pliers, adjustable wrench, screwdrivers: flat and Phillips, lockable pliers). * Starter pull rope. * Owner’s manual. * Emergency survival kit.